Picture a room full of 100 people. They’re all milling about, trying to get business done and have meaningful interactions. But what if 11 of those 100 couldn’t communicate with the rest of the people in the room? Think of how much that would affect not only those 11 people, but the dynamic of the entire room. Thirty-seven million people—11 percent of the U.S. population—speaks Spanish as their primary language. In order to have a well-functioning society, we need citizens who can communicate with this large segment of the population. Students with a background in Spanish can go on to work in fields such as translation, communications, or social work, but can also use these skills in nearly every type of workplace—from telemarketing to politics. A working knowledge of Spanish will give your students an edge in a very competitive job market. What’s it like to be a Spanish teacher? It’s challenging work being a Spanish teacher. But it can also be tremendously satisfying, as you see the light of knowledge come on in your students’ eyes and know that you’re helping them learn skills that will help them in real life—and open communication with a growing sector of American society. 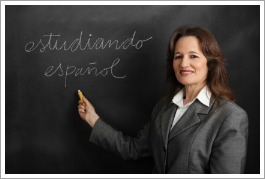 There are a number of unique roles for Spanish teachers within the U.S. For example, some Spanish teachers teach Spanish to native Spanish speakers—just as English speakers take English classes. The demand for English as a Second Language (ESL) for Spanish speakers is growing as well. Many schools also offer dual-language immersion programs, which have mixed classes of both English speakers and Spanish speakers. Dual language programs can start as early as kindergarten and go throughout elementary school; some even go into middle school and high school. The approach will vary from district to district, however—some teach 90 percent in Spanish and 10 percent in English; others teach roughly equally in both languages. Regardless of the approach, dual-language programs have many benefits for students. It helps Spanish speaking students learn English and integrate into their courses, while maintaining their own native language; research shows that students who have a strong literacy base in their native language also do better long-term with English. It’s also a highly effective way for native English speakers to begin learning and using a foreign language. There are many such programs in states such as California, where there are large numbers of Spanish speakers; currently, 30 states have dual-language programs. Also, elementary International Baccalaureate (IB) schools have a requirement of teaching a second language, which is often Spanish. This is usually taught as a part of a “specials rotation” where students will have Spanish classes once or twice a week; in a given rotation, teachers may cover art on Monday, Spanish on Tuesday, gym on Wednesday, etc. Spanish instruction requires being both social and creative. Each day you get to design lesson plans to help students learn in a variety of ways. It can be fast paced and exciting, as you’ll likely change activities every 15 to 20 minutes. It also requires perseverance and flexibility. You might try over and over to teach one particular skill and feel like you’re making no progress. But then you try another approach to teaching that skill, and get to watch your students have that moment of breakthrough—the most satisfying moment for a teacher. As a Spanish teacher, it’s not only grammar that you’ll be teaching. You’ll also cover culture, conversation, listening, reading, vocabulary, history, and literature. You’ll also use a variety of creative techniques to draw in and maintain your students’ interest. Spanish teachers have many real-life resources available to them, such as Spanish language newspapers, TV shows, and movies to make their teaching engaging for students. You’ll also have the opportunity to open a whole new world to your students. You’ll be exposing them and inviting them into knowledge of other cultures and other countries, and helping them become versed in a segment of American culture with millions of speakers. In more financially healthy school districts, Spanish teachers might also have the opportunity to introduce students to other cultures firsthand, through trips to lands such as Spain or Puerto Rico. You’ll likely have a number of different classes each day, ranging from beginning speakers to experienced ones. Classes can be divided by age or skill level. Sometimes higher-level speakers will be in the same class as beginners, if your school is dealing with budgetary restrictions. Thus, you’ll need to be versatile enough to teach each level—sometimes simultaneously. Who Speaks Spanish in the U.S.? More than 43 percent of the population of New Mexico speaks Spanish. In the two most populous states in the union, California and Texas, nearly 35 percent of the population speaks Spanish. Spanish is the official language of Puerto Rico (a U.S. territory). Although many assume it’s primarily Mexican Spanish that is spoken in the U.S., there are many dialects spoken, including Cuban, Colombian, Dominican, Salvadoran-Honduran, Nicaraguan, and Puerto Rican. There are more Spanish speakers in the U.S. than speakers of Chinese, French, German, Italian, Hawaiian, and Native American languages combined. The good news for teachers is that the number of students per class in the U.S. should decrease, according to the U.S. Bureau of Labor Statistics. A smaller class means more teachers. A large number of teachers are also expected to retire in the next several years, which will leave positions vacant for new teachers to fill. But the forecasted job growth for high school teachers is still a little slower than the overall job growth in other fields, at 7 percent growth from 2010 to 2020. School enrollment should be on the rise, especially in the South and the West, but it will still be slower growth for high school teachers than for elementary or middle school teachers. Elementary and middle school teachers can expect job growth of 17 percent from 2010 to 2020—three percent higher than overall job growth. Where you live will make a huge difference in the availability of jobs. According to the Bureau of Labor Statistics, there should be more job opportunities for teachers in the South and West, while there will be fewer in the Northeast, and the Midwest will hold steady. Spanish teachers should also consider teaching in states with a large population of Spanish speakers. By percentage, the states with the most speakers are New Mexico, California, Texas, Arizona, Nevada, Florida, New York, New Jersey, Illinois, and Colorado. You can also take a number of steps to make yourself more marketable as a Spanish teacher. You can study Spanish abroad to increase your fluency, in countries from Argentina to El Salvador. You can also teach English abroad in a Spanish-speaking country to improve your knowledge of the culture and practice your conversational and written Spanish. You could also consider volunteering or working at local adult education centers, most of which have Spanish or ESL courses. If you don’t want to take a traditional teaching job right out of college, you can also consider a program such as Teach for America. This organization places some of the most excellent graduates in some of the most challenging school districts in order to give disadvantaged schools the best teaching possible. Being part of a program like this can not only get you experience, but also can change the whole trajectory of your teaching career as you learn valuable life lessons. And don’t forget networking. It can be the difference between getting a job and not, so look into joining a professional teachers’ association to gain not only contacts but also wisdom from other members. The median annual salary for high school teachers in the U.S. is $53,230. Middle school teachers earn slightly less, with a median income of $51,960. Your salary as a Spanish teacher can also vary greatly depending on the school district and state. If you hold a master’s degree or have past teaching experience, your salary can also start higher. While the lowest 10 percent of teachers earn less than $35,000, the top 10 percent earn more than $83,000. Teachers earning at this level might also have leadership or administrative roles in their schools. There are also opportunities to be involved in extra-curricular activities as a teacher, such as coaching sports or hosting Spanish club. To become a Spanish teacher, you’ll need both a bachelor’s degree and teacher certification. The certification requirements for teachers vary widely from state to state. You can find out your state’s requirements at teaching-certification.com. Most future teachers also enroll in their university’s teacher preparation programs, which prepares them through courses ranging from technology in the classroom, to managing behavior, to different teaching methods. Most students also gain some hands-on experience through student teaching. Private schools generally won’t have the same requirements as public schools. For example, many don’t require a license to teach in a private school. However, private schools typically hire Spanish teachers with at least a bachelor’s degree in Spanish. Whether you choose to teach public or private, middle school or high school, ESL or dual-language, there are exciting opportunities in this field for a motivated Spanish teacher!